The French Clair pistol of 1893 is one of the lesser known and least documented early automatic pistols, and unusual in its method of operation as well. The majority of the successful early automatics (the Borchardt/Luger and Mauser in particular) used short recoil mechanisms to unlock, but the Clair was a gas operated design. The Clair pistol was a design patented and built by three brothers from Saint Etienne – Benoit, Jean Baptiste, and Victor Clair. They submitted their first patent in 1889, which described in general a gas-operating system for firearms. This was followed by a British patent (#15,833) in 1893 for their system, which they claimed was applicable to anything from a pistol up to a rifle, Gatling-style large gun, or even cannon. At least one functional example of their pistol was built, because it was tested (unsuccessfully) against the French Mle 1892 revolver. The Clair was chambered for the standard French Mle 1892 8mm revolver cartridge (8x27R), and had a barrel approximately 10.5 inches long. Its magazine was a curved tube in the grip which held six cartridges, nose-to-base. Loading and unloading was done through a port below the chamber (in the same location as the ejection port of a Maxim gun). A gas tube was located beneath the barrel, with a gas port 78mm back from the muzzle. The breech is locked by a pivoting wedge that locks into a shoulder cut in the bottom of the frame, between the level of the magazine tube and the bore. Upon firing, the gas piston moves back and allows the wedge to rise out of the locking shoulder and opens the bolt. The travel of the gas piston also operates a cartridge elevator, pushing the next round up from the end of the magazine tube to the level of the bore. A simple recoil spring housed inside the gas piston forces the bolt closed again, loading the next round in the process. The Clair suffered from a slew of problems during military testing, including failures to feed and fire, and gas leakage. It was also judged to complex to disassemble, too bulky (440mm/17.3in overall length) and too heavy (1.3kg/2.9lb unloaded). We would surmise that when it functioned properly, the weight and low-powered cartridge would give it very pleasant recoil, and the long fixed barrel would make it quite accurate. Unfortunately, we don’t know of any surviving examples of the pistol (although there are at least a few Clair rifles still in existence today). There is some contention that the Clair actually predated all the other early self-loading pistols, but we don’t believe that is the case. It certainly cannot contend with the Borchardt for the title of first successful self-loader, since is never went into serial production. Furthermore, early Laumann self-loaders exist with proof marks dating to 1891, and there is no evidence that the Clair existed that much earlier than its 1893 patent date. 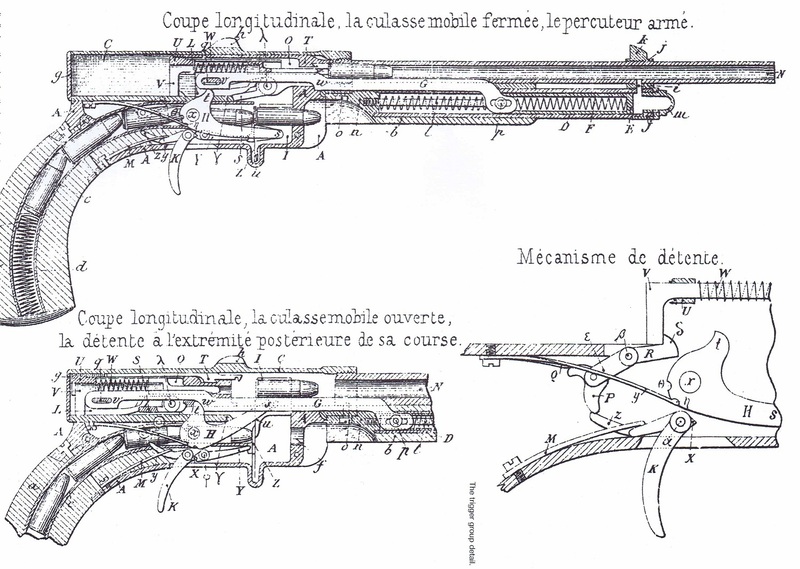 Bibliography: The Clair: The French Early Self-Loading Pistol, by Clifford Bryant, including translated content by N. Parra. Journal of the Historical Breechloading Smallarms Association, Volume 3 Number 7. It’s interesting that it so rifle designers so long to duplicate this mechanism effectively. It’s interesting that it took rifle designers so long to duplicate this mechanism effectively. I want one to go with my steampunk cowboy outfit. The pivoting block actuated by a gas piston reminds me of the BAR’s locking system. Dont quite get why they would design it to only take 6 rounds. Fabulous info! Thanks for putting in the work as always! looks like the garand long stroke gas system was based this design.